» Review: HELEN REILLY – The Day She Died. Review: HELEN REILLY – The Day She Died. 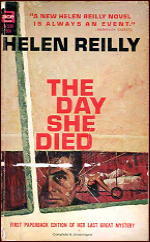 HELEN REILLY – The Day She Died. 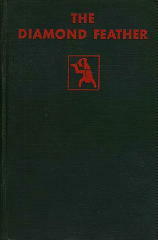 Random House, hardcover, 1962. Hardcover reprint: Detective Book Club, hardcover, 3-in-1 volume, January 1963. Paperback reprints: Ace #G-536, no date [circa 1965]; Macfadden, 1970. Checking Hubin to make sure my facts are straight, Helen Reilly’s primary series character, Inspector McKee, spent most of his career solving murders in New York City, his home base of operations, but over the years, he found himself tackling cases that took him up in Connecticut almost as often. Either way, but not always, he seems to have been pretty much a New York and New England sort of guy. Enough of these preliminaries, though, and on to the review. Fans of the Golden Age of Detection will have a lot to like with this one, since the grand bulk of it follows one of the most well known (if not most commonly occurring) settings in vintage mysteries of the 1930s, that of murder in an isolated house in the middle of a storm, with no way in and no way out. You do have to have a well-engrained “sense of wonder,” though, since New Mexico is a long way from New York City, only to have McKee end up totally by chance in the very same home of a woman recently deceased but unknown to him until mentioned to him before he left on another matter altogether. Nor is he the only victim of the storm to find refuge there, all of whom have secrets and many of whom seem to have known each other from before. There is a lot of atmosphere in this novel, in other words, most of it dark and gloomy (and the water rising), with everyone’s eyes cast warily at everyone else. There is no contact with the outside world, so McKee is accepted by everyone as the person in charge. There is much detective work to do, what with one man seriously (and eventually fatally) wounded and another body found later in the stable. Not to mention the face in the window and other signs that someone else may be trapped on the small island the house sits on in the middle of the flood. The detective work, to get back to the primary thrust of the tale, is of necessity of the most primitive, basic kind: asking questions, checking everyone’s whereabouts at crucial points in time, and even more questions. Not everyone is involved with the murders, but everyone has secrets, and McKee cannot rely on any of the answers his receives in turn being true, not even the one supplied by the watch that was stopped at the moment of the fatal blow. Once contact is made with the outside world, the solving of the case proceeds at a much faster pace – which I found somewhat of a disappointment, and if truth be told, there was no “somewhat” about it. There are some really nifty twists in the plot that come at the end, but they came too fast, as far as I was concerned, with the police work occurring mostly offstage, sad to say. I found the slower pace of the first three-quarters of the book much more to my liking than I did the final few chapters, in which everyone, having made their way to the big city of Albuquerque, is now safe and sound, or nearly so. I have to confess I have read nothing by this author, though I am familiar with the name. He’s able to say more about her overall career than I was able to in this review of only one book by her, so it’s definitely worth reading. She seems to have been one of the first American authors to have included proper police procedure in her novels, but as time went on, she became more and more cozy-oriented. It all depends on your definition of “cozy” of course, but THE DAY SHE DIED could easily fit into the category. I’d call the first 80% of it “traditional” more than cozy, given the setting of an isolated location with no way in or out. Based on this one, I’d like to read more of her earliest ones than I have. Most of the other ones I’ve read by her were written in the late 40s or early 50s. While they were more than acceptable as works of detective fiction, I don’t remember them as well as I think I will this one. Reilly’s strengths are story telling and description. She can offer a remarkably vivid account of a place and events that take place there. She is not primarily a puzzle plot writer in the tradition of Carr, Christie and Queen. Although there is a lot of incident and mystery in her stories. Her best books are two early police procedurals, McKee of Centre Street (1933) and The Line-Up (1934), and the two late New Mexico tales Steve discusses here, Follow Me (1960) and The Day She Died (1962). Anthony Boucher’s favorite of her works was Follow Me. She is not much like any other detective story writer. One can see influences from Freeman Wills Crofts (procedurals) and Mary Roberts Rinehart (mystery in the old dark house). But reading Reilly at her best is a vivid experience. …you encapsulated in two short sentences exactly why I enjoyed this book as much as I did. I’m reading my first Inspector McKee book in February. It’s the last of the eight books for a reading challenge I took up that feature cops as the protagonist. I know Reilly’s daughter Ursula Curtiss better. Several of her books were made into pretty good movies and are faithful to her stories. She was more of a suspense crime writer but she wrote some really terrific often very creepy books. The Forbidden Garden is one of her good ones. 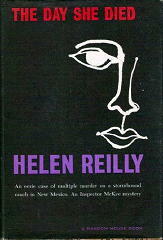 Helen Reilly had another daughter who wrote mysteries, Mary McMullen, and her brother, James Kieran, a press secretary for Mayor Fiorello LaGuardia in the 1930s wrote Come Murder Me (Gold Medal, 1951). It must have been something in the genes! In any case, you have a lot of books by Reilly to choose from, John, and from different eras. I’m going to be curious as to which one you pick, and how you like it. I really liked your comments on The Day She Died. The different views on the first three-quarters and drastically different end are interesting. I’m curious about what John thinks too! We need much, much more writing about and study of mystery fiction. Read Mary McMullen’s first mystery Strangehold / The Death of Miss X some years ago, and didn’t enjoy it much then. But maybe there are some really good books lurking in her large output. Have never read Ursula Curtiss. I only read tales in which “mysteries are solved by detectives”, and this tends to leave many pure suspense-without-mystery writers out.